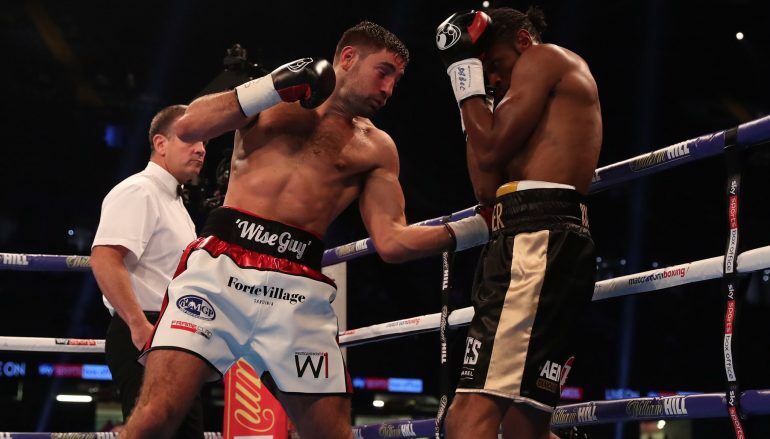 Enfield’s Frank ‘The Wise Guy’ Buglioni (21-2-1, 15KO) successfully defended his Lord Lonsdale belt for a second time with a Unanimous Decision victory against late replacement Craig ‘Spider’ Richards (10-1, 4KO). The British light-heavyweight title fight was the first significant fight of Matchroom Boxing’s show at the Principality Stadium, which was headlined by Anthony Joshua’s IBF and WBA world heavyweight title defence against Carlos Takam. The judges scored the contest 117-111, 117-111 and 116-113 in favour of Buglioni, who now only needs one more defence to own the British belt forever. Richards conceded ground in the opening two rounds, in an attempt to circle Buglioni, who remained the aggressor and caught up with the challenger on more than a few occasions. The first real signs of resistance came in the third round when Richards found room for a number of right crosses, a shot that previous opponents have often caught Buglioni with as he approaches. Buglioni, who is trained by Don Charles, began the fourth and fifth round by closing the distance, instead working on Richards’ chest. It was uncomfortable territory for Richards, a usually rangy operator but he dug in and attempted to shorten his shots. Those efforts were largely in vain and Buglioni enjoyed more success in the middle rounds, working over Richards who struggled to escape the ropes for long periods. Referee Michael Alexander seemed to be taking a closer look at Richards, who finally responded with combinations of substance in the the 10th round. 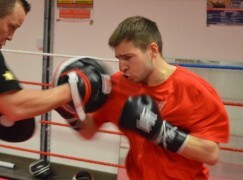 Thankfully Buglioni isn’t squeamish as he was bloodied on the left eyebrow in the penultimate session. It didn’t disrupt the champion’s rhythm, who picked his shots to see out a routine final round. 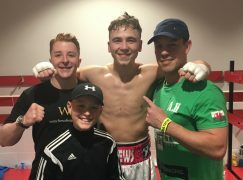 Richards, who is trained by Peter Sims and fought as recently as last week, deserved credit for stepping up a weight category, where he didn’t look out of place and lasting the 12 round distance on short notice. IMAGE BY LAWRENCE LUSTIG / MATCHROOM BOXING.